یزدانی, شهرام, ایمانی پور, معصومه. (1396). اخلاق حرفه ای در آموزش دانشگاهی: ابعاد و ساز هها. طب و تزکیه, 26(4), 272-284. شهرام یزدانی; معصومه ایمانی پور. "اخلاق حرفه ای در آموزش دانشگاهی: ابعاد و ساز هها". طب و تزکیه, 26, 4, 1396, 272-284. یزدانی, شهرام, ایمانی پور, معصومه. (1396). 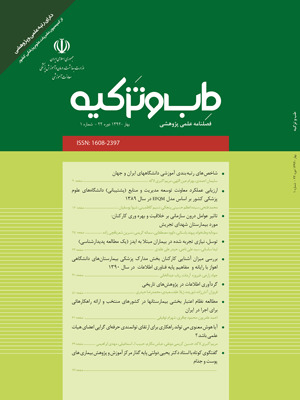 'اخلاق حرفه ای در آموزش دانشگاهی: ابعاد و ساز هها', طب و تزکیه, 26(4), pp. 272-284. یزدانی, شهرام, ایمانی پور, معصومه. اخلاق حرفه ای در آموزش دانشگاهی: ابعاد و ساز هها. طب و تزکیه, 1396; 26(4): 272-284. زمینه و هدف: مفهوم اخلاق حرفه ­ای یکی از مفاهیم انتزاعی و گنگ بوده و در متون تعاریف مختلفی از آن ارائه شده است. آنالیز این مفهوم برای رسیدن به درک مشترک و تدوین استانداردهای رفتاری و طراحی سنجه ­های ارزشیابی اهمیت اساسی دارد. هدف این مطالعه ارائه تعریف جامعی از مفهوم اخلاق حرفه ­ای در آموزش دانشگاهی و شناسایی ابعاد و سازه­های تشکیل دهنده آن بود. روش­ بررسی: به منظور تبیین مفهوم اخلاق حرفه­ا ی در آموزش دانشگاهی از روش هشت مرحله­ای تحلیل مفهوم والکر و اوانت استفاده شد. بدین ترتیب که بعد از مرور گسترده منابع و متون، 38 منبع مرتبط وارد مطالعه شدند که با مرور 21 منبع، اشباع داده حاصل شد و ویژگی­ ها، ابعاد­، سازه­ ها­، پیش ­آیندها و پی ­آیندهای مفهوم مورد نظر استخراج و آشکار شدند. یافته­ ها: نتایج بررسی متون و تحلیل مفهوم نشان داد اخلاق حرفه­ ای در آموزش دانشگاهی در راستای عمل به تعهدات حرفه­ ای اساتید شکل گرفته و دارای چهار ویژگی اساسی اتیکت حرفه­ ای، اخلاق در تعاملات اجتماعی حرفه ­ای، اخلاق در مسائل و کارکردهای تکنیکی حرفه­ ای، ارزش ها و باورهای درون فردی اختصاصی حرفه بوده و نیازمند برخورداری اساتید از توانمندی های اخلاقی شامل حساسیت اخلاقی، دانش اخلاقی، استدلال اخلاقی و خودتنظیمی اخلاقی است. نتیجه­ گیری: شناسایی مولفه­ ها و ویژگیهای اخلاق حرفه ­ای در آموزش دانشگاهی به ایجاد درک مشترک از این مفهوم منجر شده و به تدارک راهکارهای ارتقاء اخلاق حرفه­ ای اساتید که از الزامات تضمین کیفیت عملکرد حرفه­ ای اساتید است، کمک کرده و گام بنیادین در طراحی ابزارهای سنجش آن می ­باشد. Background and objectives: Professional ethics in higher education is an abstract and ambiguous concept for which different definitions have been proposed. Analyzing this concept is essential to reach a united perception, setting behavioral standards and preparation of scales for evaluation. The purpose of this study was to propose a comprehensive definition of professional ethics in higher education and to identify its dimensions and constructs. Methods and Materials: Walker and Avant’s eight-step model was used to analyzing the concept of professional ethics in higher education. After extensive review of all literatures, 38 relevant articles were included in the study. Data saturation was done by analyzing 21 articles and characteristics, dimensions, constructs, antecedents and consequents of the concept were derived. Results: The results of literature review and concept analysis showed professional ethics in higher education forms with regard to performing professional commitments of professors and has four essential characteristics which are professional etiquette, ethics in professional social behavior, ethics in professional technical functions and issues, intrapersonal professional values and beliefs, and needs ethical competencies in professors including ethical sensitivity, ethical knowledge, ethical reasoning and ethical self-regulation. Conclusion: Identification of the elements and attributes of concept of professional ethics in higher education causes in common sense of this concept. As well, it contributes in planning the developmental strategies for optimization of professional ethics in professors as a necessity for high quality assurance of their professional performance and is a fundamental step in designing its evaluation measures. Collste G. Applied and Professional Ethics. Kemanusiaan. 2012;19(1):17-33. Campbell E. Review of the literature; the ethics of teaching as a moral profession. Curriculum Inquiry. 2008;38(4):357-85. Sockett H. Can Virtue Be Taught? The Educational Forum. 1996;60:124-9. Campbell E. The Ethics of Teaching as a Moral Profession. Curriculum Inquiry. 2008;38(4):357-85. Glicken AD, Merenstein G. Addressing the Hidden Curriculum: Understanding Educator Professionalism. Medical Teacher. 2007;29(1):54-7. Rodgers BL, Knafl KA. Concept development in nursing: Foundations, techniques, and applications. 2nd. ed. Philadelphia: W.B. Saunders Co.; 2000. Baldwin MA. Concept analysis as a method of inquiry. Nurse Researcher. 2008;15:49-58. Walker LO, Avant KC. Strategies for theory construction in nursing. 5th ed. the United States: Prentice Hall; 2011. Nuopponen A. Methods of concept analysis– a comparative study. LSP Journal. 2010;1(1):4-12. Dresscher E. Professional Ethics in Teaching and Professional Teachers Organisations 2007 [cited 2014 28.05]. www.ei.ie.org]. Available from: www.ei-ie.org/ethics/file/%282007%29%20Professional%20Ethics%20in%20Teaching%20and%20Professional%20Teachers%20Organisations%20by%20Eduard%20Dresscher.pdf. Demirkasimoglu N. Defining “Teacher Professionalism” from different perspectives. Procedia Social and Behavioral Sciences. 2010;9:2047-51. Dee JR, Henkin AB. Assessing dispositions toward cultural diversity among preservice teachers. Urban Education. 2002;37(1):22-39. Ary D, Jacobs LC, Sorensen C. Introduction to Research in Education. 8th ed. Australia: Wadsworth; 2010. Rike CJ, Sharp LK. Assessing preservice teachers’ dispositions: A critical dimension of professional preparation. Childhood Education. 2008;84(3):150-3. Tichenor MS, Tichenor JM. Understanding Teachers’ Perspectives on Professionalism. The Professional Educator. 2004-2005;XXVII(1-2):89-95. Evans L. Professionalism, professionality and the development of education professionals. British Journal of Educational Studies. 2008;56(1):20-38. McKenna H. Nursing Theories and Models. New York: Routledge; 1997. Fallona C. Manner in teaching: a study in observing and interpreting teachers' moral virtues. Teaching and Teacher Education. 2000;16:681-95. Hansen DT. The moral is in the practice. Teaching and Teacher Education. 1998;14(6):643-55. Kasher A. Professional ethics and collective professional authonomy: a conceptual analysis. Ethical perspectives: Journal of the European Ethics Network. 2005;11(1):67-98. Pring R. Education as a Moral Practice. Journal of Moral Education. 2001;30(2):101-12.